In 1980, violent civil war erupted in El Salvador between the military government and rebel groups. When the military assassinated human rights activist Óscar Romero, rebel organization Farabundo Martí National Liberation Front (FMLN) vowed to end the "oligarchy of the rich." However, the government had a strong ally in the United States, which sent economic and military support. Government forces combed the country with a direct order to kill, and to leave no witnesses. In 1982, the soldiers reached the tiny village of Amatitán, where they killed over 200 civilians—men, women, and children. The few that survived fled, with little time to plan or prepare. It was not until a decade later, after the conclusion of the civil war, that Salvadorans returned to the village, to begin rebuilding their homes and burying the bodies. 30 years after the massacre, Amatitán has a new generation facing new challenges as it rebuilds. Today, Amatitán stands more than 200 Salvadorans strong. The images of Óscar Romero and Father Napoleón Macías adorn the side of Amatitán's community center. Strong advocates for human rights and changes in the government, both were assassinated by military forces. Below their likenesses reads two quotes: "El pueblo es mi profeta" (The people are my prophet) and "Los que mueren por la vida no pueden llamarse muertos" (Those who die for life cannot be called dead). Felicita Osorio Alvarado holds a calendar with photos of the Salvadorans killed throughout the 12-year civil war. Alvarado lost three brothers and her father in the conflict. Símeón Alvarez was one of the first to return to Amatitán 10 years after the massacre took place. At the Río Amatitán (Amatitán River), Alvarez says he found bloodied clothing of those murdered by the military police at the river, and that years later, blood still stained the rocks at the riverside. Today, a monument stands at the river with the names of those murdered in the 1982 massacre, which is now remembered as "El Calabozo," or The Dungeon. Women prepare for the community center for a religious celebration. Over half of El Salvador's residents are Roman Catholic, and much of the country makes a pilgrimage to the capital city of San Salvador for a weeklong celebration of "El Salvador del Mundo," or Jesus the Savior of the World. Vicente Alvarado has been the head of the community organization for the last 2 years, and give lectures about the history of the civil war to children of the town. Alvarado, who grew up in Amatitán, calls Óscar Romero, one of the martyrs of the rebellion cause, "Jesus Christ on earth." Military forces destroyed every house in village during the 1982 invasion. Every house standing in Amatitán today, including the one pictured, was built after 1992, when people began to return to the area. Catalino Abarca, a construction worker for the last 12 years, works for Asociación Agropecuaria Campesina para El Desarrollo del Norte de San Vicente (ACD), a non-governmental organization that builds houses in Amatitán. The houses, which cost $6,800 to construct, are given to recipients picked through a rigorous need-based selection process. 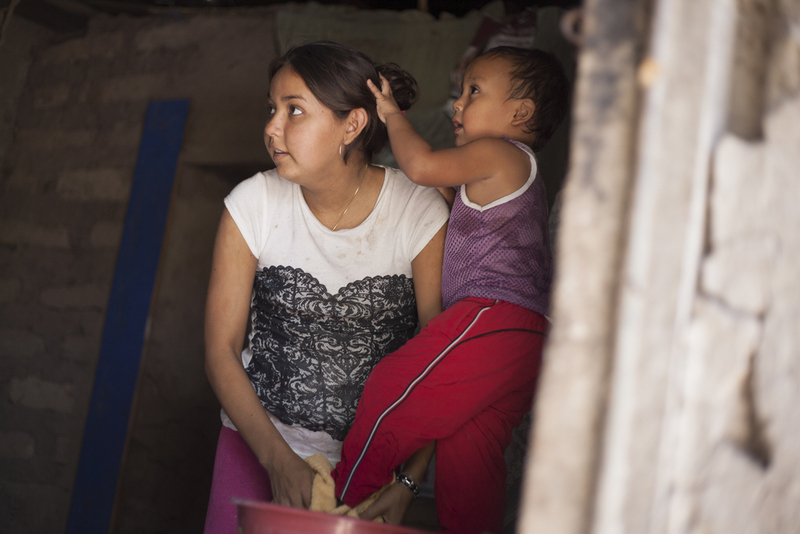 Ivania, 19, bathes her son Antony, 3, in their Amatitán home. Ivania requires dialysis for a chronic disease and was selected by ACD to have a special room built for her treatments, where they can be perfomed without risk of contamination. Esperanza was selected to be a recipient of an ACD house, a 3-bedroom, 1000-square-foot residence. However, due to dwindling donations to the organization, she risks being one of the last to receive a home. Local city halls, currently the only donors, have recently undergone a change in leadership that supports cutting funding. Jorge, 27, straightens a photo of his sister, who currently resides in Costa Rica. After the massacre, many residents left El Salvador to other Central America countries or to the United States, where they work and send money to relatives in El Salvador. 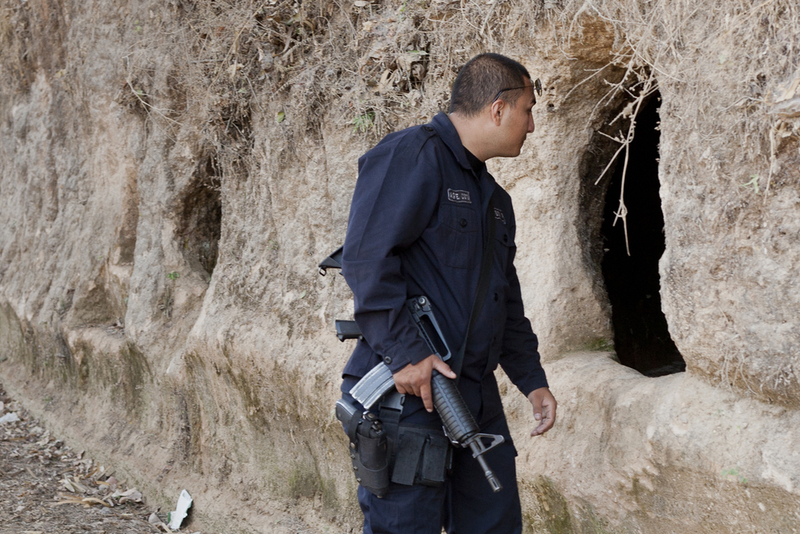 Remittances from the United States, a country whose government were allies to the military regime, are a tremendous source of income for Salvadorans; the GDP of the country is $21.2 billion, and $3.2 billion enters the country from Salvadorans in the U.S.
A police officer examines a hole in the road wall, carved during the military invasion of the town. Civilian families used them as makeshift bomb shelters for their children, to protect them from the 500-pound explosives dropped by government planes. The Salvadoran police fear today bears no resemblance to its civil war form and now operates separately from the Salvadoran army. On the truck door reads "To serve and protect before everything." Pictured, two officers assigned to accompany American visitors into the Amatitán take a break for lunch. Veronica Johanna, 11, is one of the many children in Amatitán's new post-massacre generation. The children attend school in a building next to the church, where the community gathers and prays to the memory of their families and to a peaceful future.